That’s the advantage of putting the professionals to work for you with Viafield Co-op Pro grain contracts. Because while you’re hard at work, so are the professionals at Viafield and our partners at JSA to make marketing decisions that manage farm risk. So instead of stressing over market information and trying to interpret it yourself, let our experts do it for you. Viafield Co-op Pro aims to consistantly outperform the market for the delivery period you select to market your grain. The professionals at Viafield have extensive experience managing grain price risk and delivering solutions to farmers. You meet with your Viafield Grain Relationship Manager or Specialist and commit to sell a specific number of bushels through a Viafield Co-op Pro contract based on your marketing goals. Viafield tracks and analyzes incoming data on supply, demand, weather, shipping and more. Viafield regularly develops actionable trading plans to price your grain. Viafield makes final trading decisions with the goal of getting you the best price for your grain. 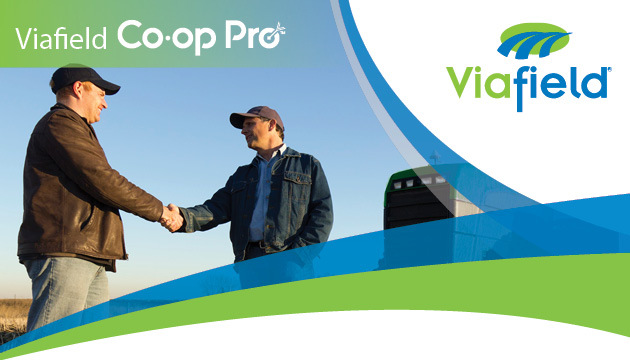 You receive performance updates on your Viafield Co-op Pro contract through monthly emails and quarterly webcasts. Regular communication from your Viafield Grain Relationship Manager or Specialist keeps you informed on our trading decisions. You receive the payment for your bushels based on your Viafield Co-op Pro’s performance and your designated delivery date and location of the grain. Purchase Contract terms apply. This is provided to you for information purposes only, does not constitute an offer, and is not intended to be a part of any contract that may be entered into. Please consult the Purchase Contract for the terms and conditions that will govern the sale and purchase of grain. Information provided is general in nature and is provided without guarantee as to results. The information is not intended to be, and should not be construed as, trading, financial, legal, or tax advice. No warranty is made with regard to the information or results obtained by its use. Viafield, a cooperative, its partners and affiliates disclaim any liability arising out of your use of, or reliance on, the information.